I am presently infatuated with mushrooms which are now arriving at our local outdoor markets and grocery stores in abundance in both variety and quantity. For this soup I used a combination of dried porcini for that earthy rich flavor only a porcini can add as well as fresh mushrooms. You can choose whichever fresh mushroom you prefer, but I’d recommend portobello, cremini, or fresh porcini if available. I used a wild mushroom mix that included porcini and cremini as well as a number of other varieties. The base of this soup is creamy although I do add cooked faro at the end for texture. A little silken tofu adds both body and a little slkiness, but the addition of potatoes is the primary source of thickener for the soup. To garnish this soup you could add a variety of options including crisp pancetta bits, a dollop of sour cream or pesto, or some cheese topped “croutons” as I show in my photo. Potatoes and silken tofu add creaminess and body to the soup in place of cream. Add the tofu and continue to cook until thickened. 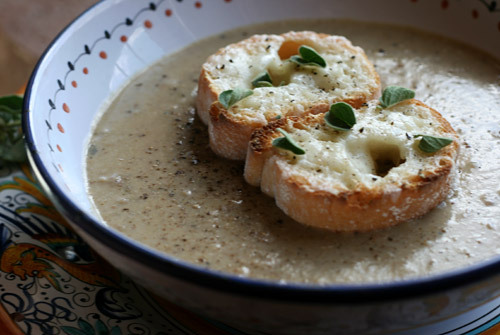 Spoon the warm soup into individual bowls, and then float the cheese "croutons" on each.